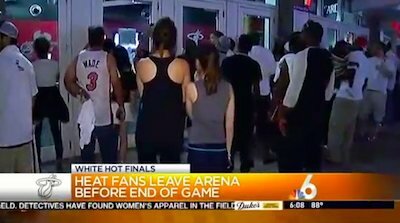 Fans who leave early aren’t really fans. You should never give up on your team. You should support them until the bitter end. Especially with baseball because it isn’t over until you get the final out. Besides, you’ll never experience the thrill of a walk-off win or an amazing comeback in overtime if you leave early. I don’t even understand why you would want to leave early. Tickets are expensive these days. You should see the complete game and get your money’s worth. Sure, you might want to beat traffic but there will still be traffic. Leaving early won’t help you any. In fact you should linger and stay longer, maybe kill some time at a restaurant or bar and let the roads thin out a bit. Take some time to reflect on the game you just saw with some friends and analyze the key plays and turn of events that affected the outcome. You don’t want to show up late and leave early like a Dodgers fan. People respect the Dodgers, but nobody respects Dodgers fans. Stay for the whole game. Don’t leave early.